This soup recipe came together on accident. I had forgotten my grocery shopping list at home and bought 2 leeks instead of 2 fennel bulbs. Well, I had to use the leeks, so I figured I would use them in a soup. With the soup idea in mind, I went off to scavenge in my pantry. There I found the Cannellini beans and the recipe began forming itself in my mind. Sadly I did not have any onions at the time (still not sure how that happened), but I did have a shallot. From there I just threw things in the pot, waved my wooden spoon, and prayed for the best. 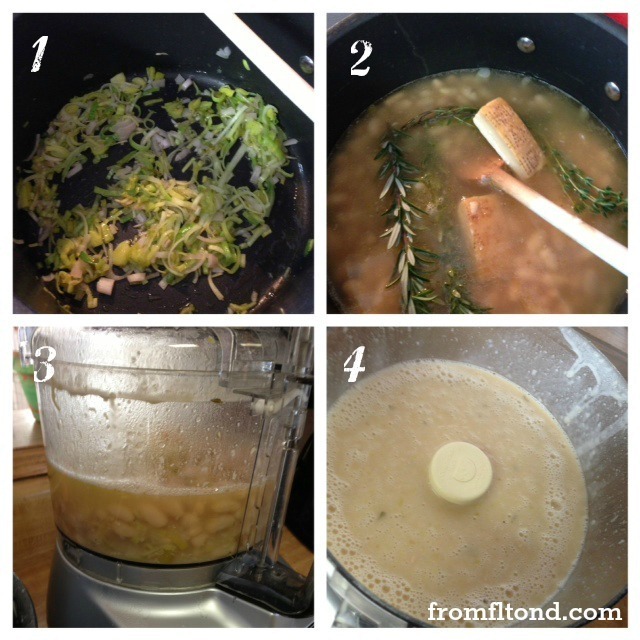 The first time I used 3 very large sprigs of rosemary and it overpowered the flavor of the soup. So be warned. This soup takes no time to put together, so it is perfect for a busy evening or afternoon. If you would like to add some extra protein to this soup. Chunk up and add some cooked chicken breast or shred up a cooked rotisserie chicken from your grocery store. In a large pot, add olive oil, leeks, shallot, and 1/2 tsp salt. Sauté until the shallot and leeks are soft. Then, add the minced garlic and sauté for another minute. Add the wine, chicken broth, beans, rosemary, thyme, and Parmesan cheese rinds (the secret ingredient in all my soups). Be careful with the rosemary. If you add too much it will overpower the soup. Bring to a boil and then reduce heat to a simmer. Continue to simmer for 20-25 minutes. Remove from the stove. Take out the Parmesan rinds, rosemary and thyme sprigs and throw them away. Working in batches puree in your food processor. If you like your soup chunkier only process half the soup in the food processor. Add salt and pepper to taste. I garnish my soup with shavings of Parmesan cheese. Feel free to use some crusty bread to dunk in your soup! Enjoy! **Note: If you would like a thicker/heartier soup, do the following…Peel 3-4 potatoes and dice them. Add the diced potatoes at the same time you add the chicken broth. Simmer until the potatoes are soft. Then, puree batches of the soup in your food processor. 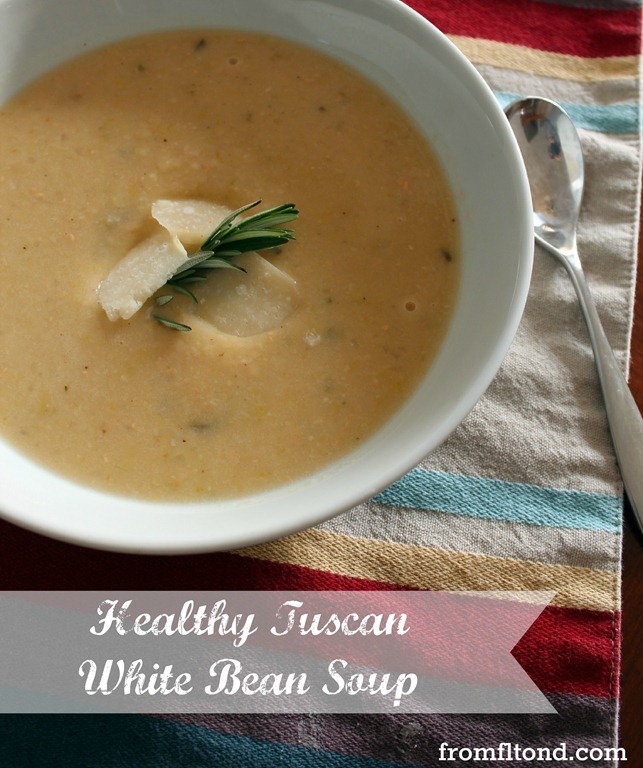 This entry was posted in Recipes, Soups and tagged easy soup recipe, healthy tuscan white bean soup, soup recipe, tuscan white bean soup on January 24, 2013 by fromfltond. I’ll head over to your blog tomorrow and link up! Thank you for letting me know about it too! Made your DELICIOUS soup and gave you a shout out on my blog.